MORE than 125,800 parking tickets were issued in towns and cities across Northern Ireland in 2011. The Detail has compiled an interactive map which shows the number of tickets issued in each Northern Ireland town and city as well as the most ticketed street/car park in each area. The high ticket figures in some urban areas will add weight to the claim of some business representatives that aggressive ticketing designed to improve traffic flow is in fact driving customers away from their shops. As well as the cost to businesses and ticketed drivers, parking enforcement is also coming at a high price for local taxpayers. 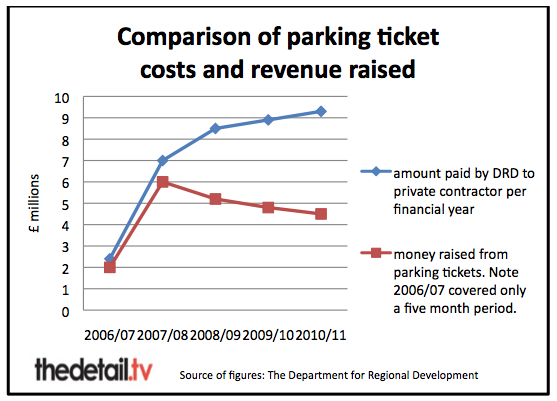 Additional figures we obtained from the Department for Regional Development (DRD) show that the cost of enforcement has been steadily increasing since it was privatised in 2006 and this swamps the money raised through parking tickets by millions of pounds annually. DRD admits that the cost of providing parking services exceeds revenues received but insists that the benefits of reduced congestion, improved access to town centres and improved road safety are vital to local economies. The department released information on each of the 125,848 tickets issued in Northern Ireland between January 1st and December 31st last year in response to a Freedom of Information request from The Detail. We were given the date, time, location and reason for each ticket and were also told if the payment owed to the Roads Service has been fully paid, cancelled or remains outstanding. Our map shows that some towns were hit with thousands of tickets as a penalty for illegal parking – while drivers in other areas can relax in what appear to be ticket-free zones. We examined the costs of parking enforcement and how this compares with the revenue raised through parking tickets. Our calculations show it is far from a money-making venture for the government. Members of the public shell out millions of pounds annually in parking ticket charges but this revenue goes nowhere near covering the costs of having 115 parking attendants patrolling our streets on a daily basis. Their job is to issue Penalty Charge Notices – commonly known as parking tickets – to vehicles detected as illegally parked. The DRD’s Roads Service takes responsibility for the enforcement of most parking restrictions but on-the-ground enforcement is provided by private contractor NSL Services Group. DRD Roads Service has no responsibility for parking restrictions or enforcement action on private ground, for example shopping centre and hospital car parks. The PSNI would also still deal with some criminal offences, like dangerous parking and parking causing an obstruction. Each parking ticket issued by NSL costs car owners £60 – or £30 if it is paid within 14 days. The revenue raised by parking tickets is used, along with the income from car parking and other charges, to supplement the overall financing of DRD’s Roads Service by central government. However, the current cost of providing parking services far exceeds the revenues received. Figures requested from DRD by The Detail show that £36.1m has been paid to NSL since the current parking enforcement and car-park services contract with NSL (formerly NCP) began in October 2006. During the same time period, the revenue raised by parking tickets totalled £22.5m. The cost of the private contract has steadily increased since its first full year of operation in 2007/08 when DSD paid NSL £7m. The cost for the last financial year (2010/11) were almost a third higher at £9.3m. 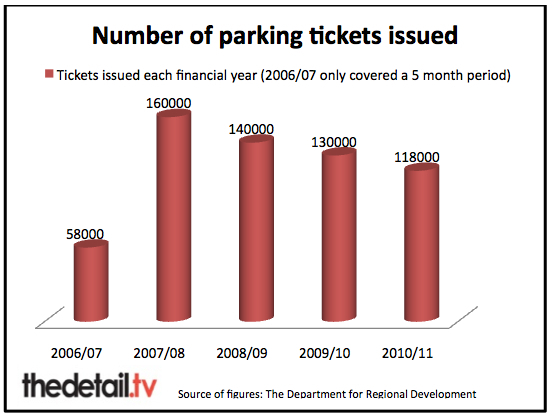 The number of parking tickets issued has also declined with 160,000 written in 2007/08 compared with 118,000 in 2010/11. However, the number of tickets issued from January-December 2011 was much higher than for the same period in 2010 – 125,848 compared with 116,009 the previous year. A DRD spokesman said: “The income from PCNs (parking tickets) does not cover the full cost of the department’s contract with NSL. “The aim of effective parking enforcement is to reduce the number of illegally parked vehicles on our streets and in our car parks. If this is achieved then the income from PCNs is reduced and the deficit is increased. We analysed the detailed information released by DRD on each individual parking ticket issued during 2011. Belfast’s Lisburn Road holds the unenviable title of being the most ticketed area out of all of our streets, roads and car parks with parking attendants giving out 2,296 tickets here for parking violations during 2011 – largely as a result of a contested urban clearway. Local traders claim that shoppers are being “hounded” away from the road by over-zealous traffic attendants. However, the Department for Regional Development argues that the road is a priority clearway which needs to be patrolled on a daily basis to ensure the free flow of traffic and the overall safety of all road users. Read the full Lisburn Road story here. As of March 6th this year, 102,663 (82%) of all of the penalty charge notices issued in Northern Ireland last year had been fully paid at the full cost of £60 or the £30 discounted rate. A 50% reduction applies if the charge is paid within two weeks. The payment for 11,300 tickets (9% of the total) remained outstanding. This represents £678,480 in money still owed to central government. Clamping and removal operations can be used for debt recovery purposes when parking tickets are not paid. A further 11,214 tickets were “cancelled”. The DRD said that this can be due to evidence being produced later by the driver such as a valid blue badge or a pay and display ticket which had fallen from view. We have compiled tables which list the total number of parking tickets issued in each town . We have also alphabetically listed each street within every town given tickets and detailed the number of tickets per street. Click on the following links for this information: Ahoghill – Bangor, Belfast, Bushmills – Dunmurry, Enniskillen – Lurgan and Maghera – Warrenpoint. And click here to see the top 10 streets, roads and car parks where the most tickets were issued. Lisburn Road was followed in ticket numbers by Victoria Market car park in Derry (1,445 tickets), Buttercrane Quay in Newry (1,369) and Eden Street car park in Enniskillen (1,340). The most ticketed town was Belfast (36,280), followed by Londonderry (11,843), Newry (8,499), Lisburn (7,625) and Ballymena (6,851). There was a big difference between the number of tickets issued in some towns compared with others of a similar size based on 2001 Census population figures. For example Ballymena (6,851 tickets) and Coleraine (3,291 tickets); and Antrim (1,297) compared with Omagh (5,097 tickets). Almost 18% of tickets (22,137) were issued at 11am, 15% at 2pm, 14% at 3pm and 13% at noon. Only two tickets in 2011 were issued at 10pm at night and none were written in the time after this and before 7am. The DRD said that the stated time tickets were issued is approximate – for example 11am could be between 11am and noon. 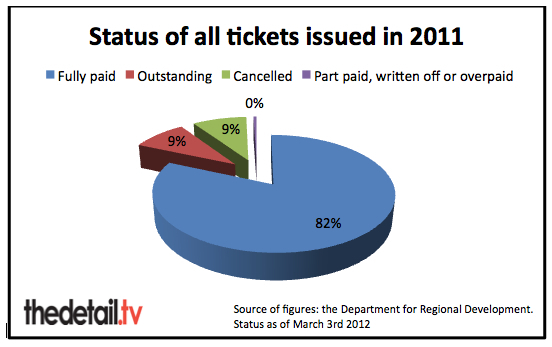 We have calculated that an average of 353 tickets were issued each day of 2011. The largest daily ticket output was on September 22nd when 535 tickets were written by traffic wardens. The most common reason for tickets being issued was for parking in a restricted street – related to double and single yellow lines (32,048 tickets). This was followed by being parked in a pay and display car park without clearly displaying a valid pay and display ticket (18,537 tickets) and parking on a street for longer than permitted (17,378). There was a gaping hole in the middle of the Northern Ireland map where no parking tickets were issued but DRD has denied that any town or village is a ‘No Go Area’ for traffic attendants. Instead, the department said that some areas have “no traffic management need”. A DRD spokesman said: “There are no ‘no-go areas’ as far as parking enforcement is concerned. “There are, however, a number of rural towns and villages with few, if any, parking restrictions to enforce. This may be because there is no traffic management need. The ticketless towns include Dungiven, Claudy, Pomeroy, Draperstown, Cushendall and Glenarm. The Londonderry Sentinel reported in May 2010 that a proposal to have traffic wardens patrolling in Dungiven would not be going ahead. A DRD spokesman told the newspaper that it did not consider there was currently a need for routine patrols despite concerns raised about parking problems by local SDLP councillor Michael Coyle. The representative body for the independent retail sector in Northern Ireland has claimed that shoppers are being driven off many of Northern Ireland’s streets and roads by over enthusiastic traffic attendants. Glyn Roberts, chief executive of the Northern Ireland Independent Retail Trade Association (NIIRTA), called for better parking options in our towns and he also questioned why no tickets were issued in some areas. Mr Roberts said: “There are a lot of areas where the ‘Red Coats’ (parking attendants) are over-zealous. “We led a campaign to oppose additional on-street parking charges and during this we impressed on the Minister the need for parking attendants to show more flexibility and sensitivity. “I’m not saying that they should turn a blind eye but if someone is two minutes over their time they should not be slapped with a ticket automatically. “It is crucial at this time that we get as many people as possible into our town and city centres. Over-zealous parking attendants will act as a deterrent. Mr Roberts said there are particular parking challenges in Belfast and in particular for arterial routes. He said: “For example, the Lower Newtownards Road is in deep decline in retail terms. Many potential customers pass through every day but there is nowhere for them to stop and shop. Phil Flanagan, Sinn Féin Assembly member for Fermanagh and South Tyrone, has already raised his concerns about the costs associated with parking enforcement with DRD. He also said that small business are being “crippled” by aggressive ticketing in some areas. Mr Flanagan continued: “Regional Development Minister Danny Kennedy has informed me that the current contract with NSL expires in October this year. NSL is the company contracted by DRD to enforce parking restrictions here. 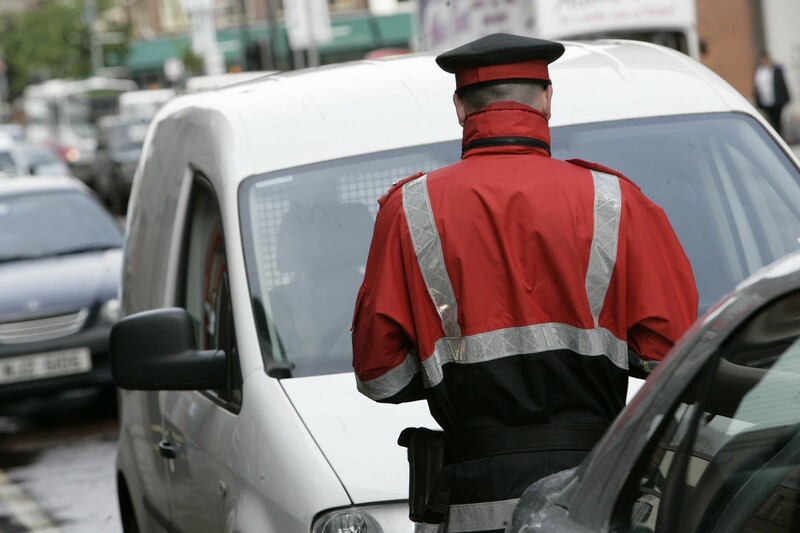 It is the largest employer of civil enforcement officers, parking attendants and traffic attendants in the UK and provides on-street parking enforcement for more than 60 local authorities. We asked the company why the cost of the Northern Ireland contract had increased by almost a third since 2007/08 and whether we were getting value for money. A spokesman said: "NSL delivers a comprehensive, effective and efficient parking service on behalf of DRDNI. “Our role is not to deliver revenue, but to keep roads safe, traffic flowing and ensure that all road users have fair access to parking spaces. “We do this by deploying 115 traffic attendants every day throughout Northern Ireland, operating and maintaining pay and display machines, managing over 100 car parks and targeting Blue Badge fraud. “To support this work we also provide cash collection and reconciliation, administer season tickets and cashless parking systems and operate a clamping and vehicle removal service.